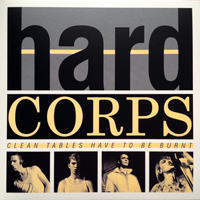 Minimal Wave is proud to announce our 35th release, a full length LP release entitled “Clean Tables Have To Be Burnt” by UK legends Hard Corps, a band we’ve been long time admirers of. Aside from their releases on Survival and Polydor, Hard Corps gained some notoriety for their unique and uncompromising live shows throughout the 1980s. It was the juxtaposition between their hard edged industrial sound and the fragile and enigmatic vocals of French frontwoman Regine Fetet that created an unusual dichotomy, lending to their strength of character as a band and thus allowing them to stand out from the rest. 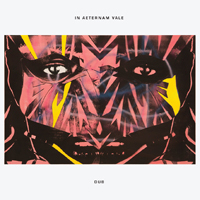 A 12” white label, released by Survival Records, containing the hammering rhythmic attack of Dirty and the softer, melodic, pulse of Respirer (To Breathe) was circulated around London’s dance floors. In no time a wave of attention hit them and throughout 1984 and into 1985 they dominated the independent pop charts. John Peel championed them on his infamous late night Radio One show and they headlined at his ICA Rock Week in the Mall, London. By 1985 Hard Corps had signed with major label giants Polydor. This enabled the band to work with a couple of their favoured and respected producers, Martin Rushent (known mostly for his exceptional work with the Human League) and Depeche Mode producer and Mute Records supremo, Daniel Miller. These sessions provided the public with just one single due to the labels non-promotion, Je Suis Passée, a sweeping arrangement of breathtaking beauty, combining pumping sequences and sheer power of emotion of Regine’s voice. The band went on a major tour with The Cure in 1985 and Depeche Mode in 1988, before finally disintegrating. Our sublabel Cititrax, is proud to present new music from Brooklyn based synth duo Innergaze. Their second LP, “Mutual Dreaming” is a highly anticipated release and we’re ecstatic that the vinyl will finally be out this month. The “Mutual Dreaming” LP is a limited pressing of 999 copies on 160 gram vinyl, housed in a high quality full color printed jacket featuring a collaborative artwork concept by Veronica Vasicka and Aurora Halal. Purchase the record here, $20. Click on titles for audio sample links. 3 Is This Your Love? Out now! 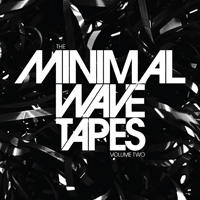 Minimal Wave proudly presents V/A The Minimal Wave Tapes: Volume 2, a collaborative release with Stones Throw Records and follow up to V/A The Minimal Wave Tapes; Volume 1. A collection of rare electronic music compiled from bands around the world, most of the songs were recorded in the 1980s and originally released on limited edition cassettes or vinyl by the artists themselves, and only a handful of people knew about them. Now they’ve been remastered from their analog source tapes, brought to you by Veronica Vasicka and Peanut Butter Wolf. 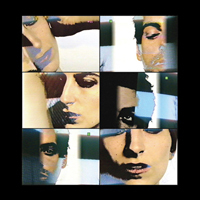 Some ot the tracks are highlights of Minimal Wave’s recent output and others are glimpses into future releases. Huge thanks to all the artists involved. Nice FACT review here and also check CMJ’s review here. CD $18, 2LP $20 purchase here. Digital here. 4 Das Ding – H.S.T.A. 5 Subject – What Happened To You? Bal Paré – Best of.. 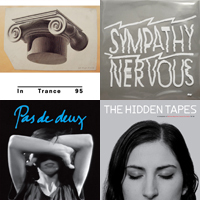 Stream the Minimal Wave radio show on East Village Radio live every Sunday from 6-8PM EST, or listen to the archives anytime with EVR’s player. 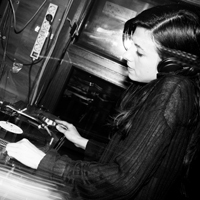 Check out Veronica’s exclusive mix and interview for Dazed & Confused in the April issue. Copyright © 2012 Minimal Wave, All rights reserved.